The regional Qadh of Eastern region Sheikh Ahmed Wandega has advised politicians to put aside their political differences and embark on settling issues amicably inorder to create lasting peace . Wandega made these remarks while addressing the media after concluding a one day conference of the inter-religious council that took place in Mbale on Thursday 14th March. “Even the president is in favour of dialogue in fact for the dialogue to register success we must respect each other”. He said. The conference that was organized by the Elders forum Uganda in conjunction with the Inter-religious council was attended by representatives from different faiths..
Canon Justice James Ogoola who represented the elder’s forum said that the major reason for organizing these conferences is to sensitize religious leaders about peace creation. 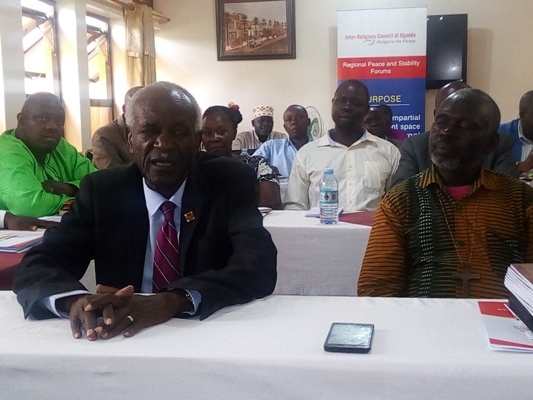 “we started in Western Uganda last week and now we are in east the main reason for our movement is peace we are preaching peace , we want religious leaders to be united the Uganda we want is that full of peace” he said. Bishop Ivan Mulepi the regional spokesperson of the National born again in Uganda said that the conference helped him to change the negative perception he had towards the Inter-religious council. “At first I had a bad perception about the council thinking that it is just there to divide but from now I have realized that they are there to unite here they work as a team” he said. Last year in December the inter religious council organized a dialogue with a major objective of bringing all the political leaders together stop the issues of settling issues with violence but however on many occasions different politicians have failed to implement this.